The 2018 Mazda CX-5 was this week named the New England Motor Press Association (NEMPA) Best In Class Compact SUV at the group's annual Winter Driving Awards ceremony at MIT. Each year the members of NEMPA test dozens of vehicles in multiple segments to determine which handle the harsh winters of New England best. 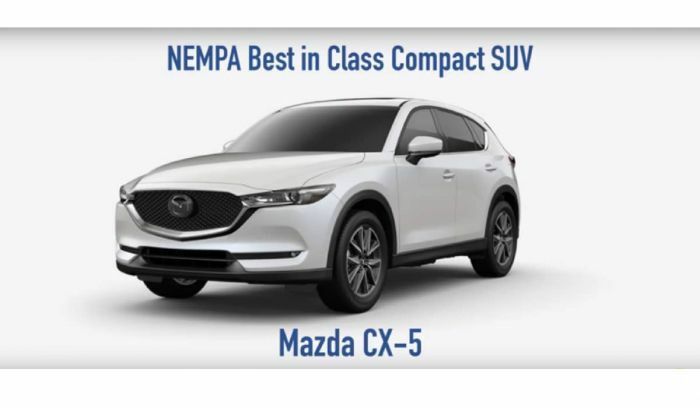 In the hottest vehicle segment in America, the compact crossover segment, the members of NEMPA chose the 2018 Mazda CX-5. The Mazda CX-5 wins a lot of comparison tests on the basis of its fun driving experience and sporty ride by comparison to its peers. However, the Mazda CX-5 may also be the most well-appointed and most premium of the mainstream offerings in this large segment. Add to that an IIHS Top Safety Pick rating, and it is easy to see why the members of NEMPA felt the CX-5 was deserving of recognition. The CX-5 is no stranger to the Hareyan Publishing extended family. One of our associates from emaxHealth.com purchased a new 2018 Mazda CX-5 this past year and has written two pieces for our readers. In the first, she explained why she switched from a vehicle costing 50% more to the CX-5. In the second, she explained the five main reasons she found the CX-5 to be the best vehicle in its segment after taking a hard look at, and test drives in, competitors like the Honda CR-V and Nissan Rogue. The Mazda CX-5 joins the Jeep Grand Cherokee Trackhawk, Acura MDX, Mitsubishi Outlander PHEV, Lincoln Navigator, Infinity QX80 and Jeep Wrangler in the crossover/SUV awards group by this year's NEMPA voting.